Located at 1142 metres above sea level in Bedugul, the Bali Handara Kosaido Golf and Country Club eighteen hole, par 72 championship golf course is listed among the world's fifty greatest. Popular for it's degree of difficulty, the scenery and average temperature of 16-20 degrees Celcius make a pleasent change from the heat of southern Bali. 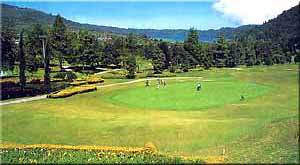 The course was designed by international golfer and course architect, Peter Thompson, Michael Wolferidge and Associates and is surrounded by mountains with a panoramic view of Lake Buyan.